This Granola is a staple in my house, but I have to make a double batch or else it doesn’t last for very long! Once made, it can be stored for 3 weeks in an airtight container and is a great quick breakfast alternative to those shop bought cereals that are high in added sugars. It actually helps stabilize blood sugar levels due to its high fibre (8g) and protein (17g) content…and that’s before you’ve even added even more goodness in the form of a nut milk and some antioxidant-rich berries! Buckwheat is a great source of B vitamins and several dietary minerals, with content especially high in magnesium, manganese and phosphorus. Goji berries and mulberries are rich in vitamins and minerals, particularly vitamin C, iron and antioxidants. Hazelnuts are rich in heart healthy mono-unsaturated and essential fatty acids; and as well as being an excellent source of Vitamin E, they are packed with B vitamins, particularly folate. · Mix together all of the buckwheat groats, oats, nuts and seeds; and distribute evenly between 2 roasting dishes. · In a small saucepan, add the water, coconut sugar, coconut oil and cinnamon and heat gently until all of the sugar has dissolved. · Spoon by spoon, mix the liquid with the nutty oat mixture, making sure that it is all coated. 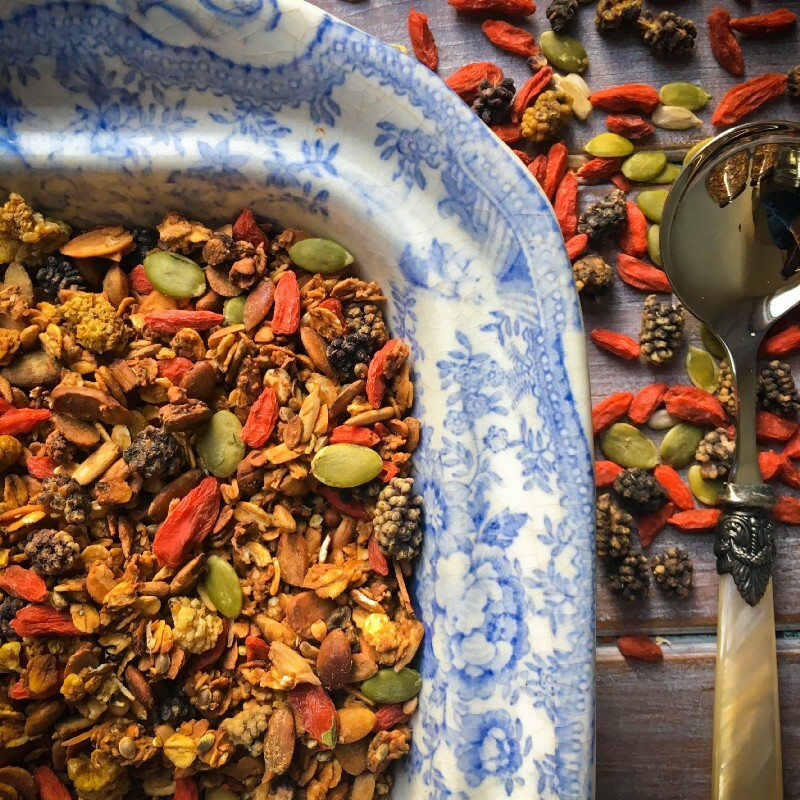 · Once cooled, add the goji berries, dried apricots and mulberries and store in a large airtight container.